The above photo was taken at the Wheels Through Time museum in Maggie Valley, North Carolina. It is more about showing the engine than me. It is a Harley-Davidson F-head V-twin engine from around the 1920's which has been modified so the internal components can be seen and studied. 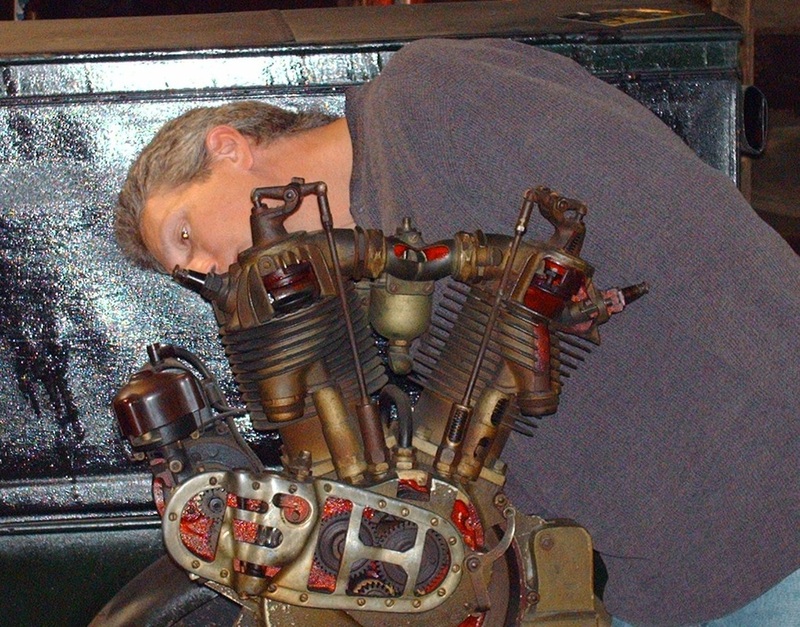 Many of the early engine performance modifications, including cam profiles, were done on motorcycle engines. This valve train is much different from the typical push rod engines today. Earlier single cylinder motorcycle engines worked with an atmospheric intake valve and did not even have an intake cam profile. This is a good place to start learning for anyone interested in camshafts and cam profile designs. My name is Michael Ingram. I have worked in the camshaft manufacturing industry over 30 years. In that time, I have designed cam profiles, generated cam profile models and master plates, and ground camshafts. At various times, I have been involved in almost every aspect of the camshaft manufacturing process. For several years, I also assembled racing engines made up of components that we either modified or manufactured in house. I also modified Holley carburetors for many years. A large number of those modified carburetors were used by the top teams in NASCAR. I learned much about the inner workings of the internal combustion engine during that period. I continue to learn as I am constantly reading and studying material on these subjects along with my other ﻿﻿interests and activities﻿﻿. I believe one should never quit learning. The "photos" page shows some of the race car teams and engine builders I ground camshafts or built carburetors for (or both) back in the day with Reed Cams. Reed Cams was one of the few shops in the country, at the time, that built racing engines, ported cylinder heads and intake manifolds, modified Holley carburetors, designed and ground camshafts, and had a sophisticated engine dynamometer and the latest flow benches. Business was all done under one roof and was available to anyone. I was very fortunate to have learned from John Reed and others and been able to take part in all of that. Sadly, Reed Cams is no longer in business, but if you need information about a Reed camshaft, or would like to have one made, I can help you with that. Being a small independent designer allows me the luxury of spending as much time as needed on each profile to make it the best it can be. It also allows me to do it for much less than the cost of your time or hiring another employee and the expense of buying a new computer and software. I would truly appreciate the opportunity to earn your business. Please do not hesitate to contact me with any questions you have. All of your cam profile design data and your identity is kept completely confidential. I will never release information on anyone's cam profiles or who I do designs for. All of that information is secure and stays with me. Thank you for visiting my website. Check back often as I am always trying to improve it and the business. There is a lot of good information posted on the "cam talk" page and you can gain a little insight into my thoughts and ideas. Please leave any helpful comments or send me an email.